When the mercury rises in the Central Valley, it’s time to head to Tahoe. And that’s exactly what we did last week. 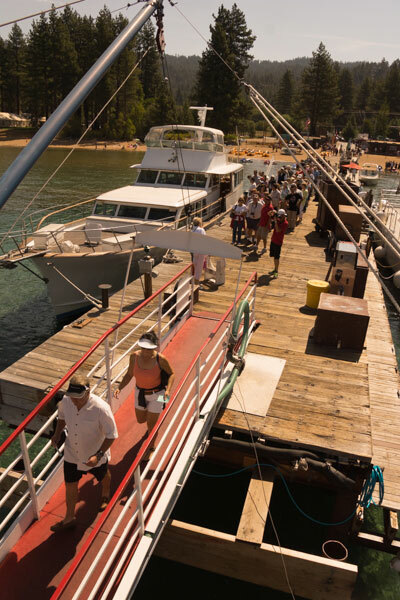 Granted, we traveled there to see Journey and the Steve Miller Band (who by the way, rocked Harvey’s amphitheater); however we lingered a bit to check out the access on the MS Dixie II — Lake Tahoe’s only sternwheeler. And I have to say that the MS Dixie II equally rocked, on access for wheelchair-users and slow walkers. Accessible bus transports passengers to and from local hotels. 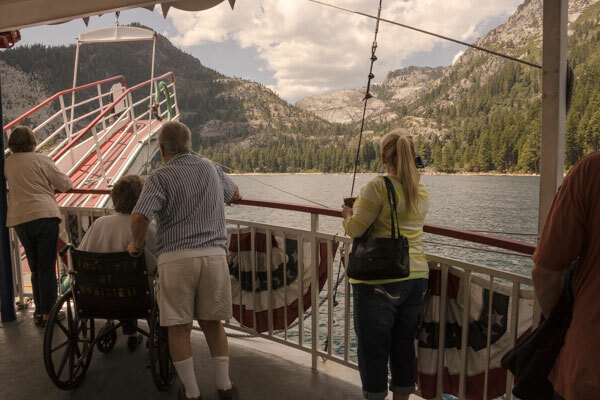 Docked in Zephyr Cove, just a 10-minute drive from Stateline, the MS Dixie II offers scenic cruises around the largest alpine lake in the world. There’s plenty of accessible parking in the Zephyr Cove Resort lot, with level access to the ticket window. 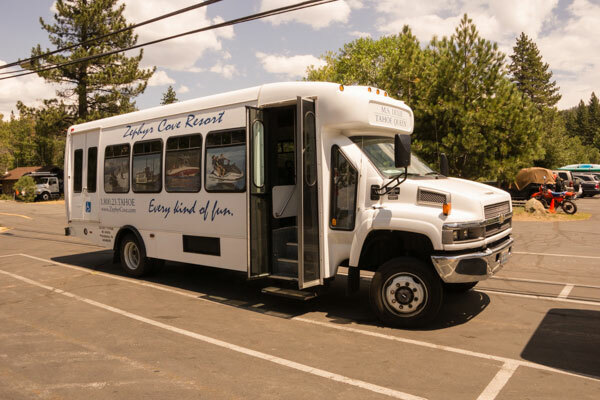 Alternatively, if you want to dodge the $8 parking fee, free shuttle transportation is available to and from these South Lake Tahoe locations. Just let the reservation agent know that you need an accessible shuttle when you make your reservation, and they’ll make sure and send out their lift-equipped bus to fetch you. Once you arrive at Zephyr Cove, you’ll find level access to the long pier out to the MS Dixie II, which offers ramped boarding with a level transition to the main deck. If you can’t manage the distance down the pier, just let the folks at the ticket window know, and they will take you to the ship in one of their loaner wheelchairs. Best bet is to arrive early though, as boarding starts a half-hour prior to sailing, and the MS Dixie II always departs on time. Once aboard you’ll find ramp access over the coaming (lip) to the main deck cabin, which has table-and-chair seating, a very roomy accessible bathroom, lots of windows and a full bar and lunch menu. There’s only stair access to the rest of the ship, but the view is great from below. 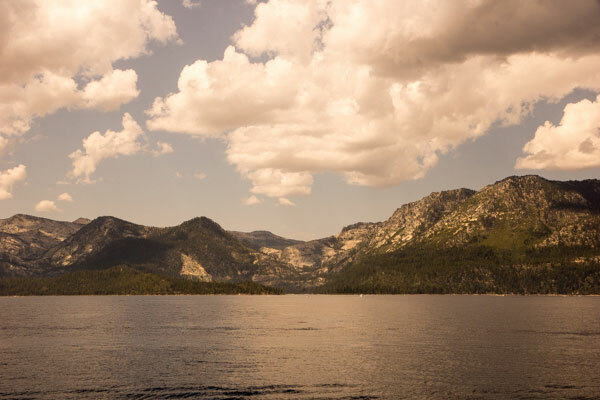 As you cruise over to Emerald Bay, you’ll be treated to a narrated tour by “Mr. Tahoe”; and I have to say, his commentary was very interesting and entertaining. He even threw in a little musical entertainment and a contest near the end of the cruise. I was a little disheartened when I heard the recorded safety announcement at the beginning of the cruise, but was happy to discover that the rest of the program was live. All in all, the one-and-a-half hour cruise went by way too fast, and my time out on the lake was simply magical. And since I left the driving to someone else, I could even sit back and enjoy an adult beverage while on board. 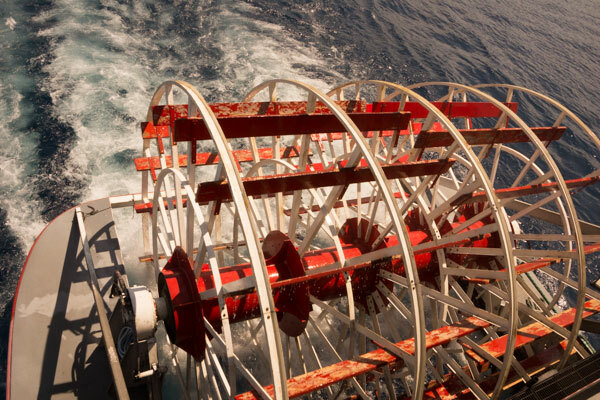 For more information about this very accessible (and fun) cruise, visit the MS Dixie II website. Plan ahead and make your reservations on-line or by phone (775-589-4906), as far in advance as possible, as space fills up fast on this popular cruise. Enjoying a cruise on the MS Dixie II is a very accessible way to dodge those triple digit valley temperatures. Sadly, we had to return home after the cruise, and at 6 PM, it was still 101 in the valley. Yikes! We should have stayed in Tahoe another night! This entry was posted in Attractions, Cruises, Destinations and tagged cruise, Lake Tahoe, MS Dixie II, Nevada, wheelchair by Candy B. Harrington. Bookmark the permalink.